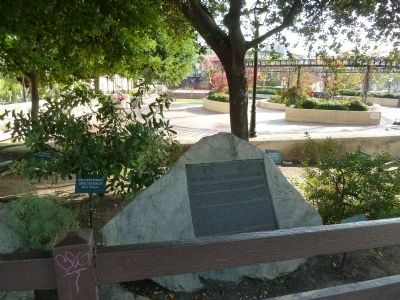 This plaque and garden are dedicated to the memory of the first peoples who lived in what is now the County of Los Angeles. Some of the earliest Indians were members of the Uto Aztecan linguistic family or were descended from the Shoshone Tribe. They lived in villages close to the ocean or to rivers and streams. The Indians had dishes of soapstone and steatite and simple tools such as scraping stones and fish hooks, and they made excellent baskets. Their houses were of a circular shape with willow stick frames covered with grasses and rushes. Men wore no clothing while women wore skirts of buckskin or fiber. In cold weather both sexes used skin capes and fur blankets. As hunters and gatherers their diet consisted of acorns, berries, seeds, seafood, animals and birds. the mission with which they were associated. Under the guidance of the Franciscan Missionaries, the neophytes, comprising a vast work force, grew crops and tended cattle. Vulnerable to the newcomer's diseases and to a different, more regimented life, and deprived of their native culture, the Indians suffered greatly and their numbers rapidly decreased. After the missions were secularized in the 1830's they drifted into the towns and lived in hardship and poverty. This continued into the American Period until two smallpox epidemics of the 1860's decimated the remaining Indian population. Very few survived into the Twentieth Century. The village of Yang-Na was known to be close to the Rio de Porciúncula (Los Angeles River), near where El Pueblo de la Reina de Los Angeles was founded in 1781. Recent archaeological excavations in this area have uncovered many artifacts recording the culture of the Indians. 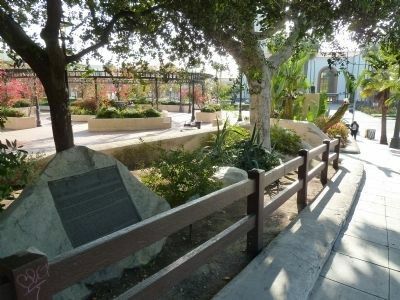 This memorial garden, containing plants used by the Indians for food, clothing or ceremonial purposes, honors their contributions to Southern California and their stewardship of the land. This memorial garden was made possible by grants from the City of Los Angeles and the Santa Monica Mountain Conservancy. Erected 1986 by City of Los Angeles and the Santa Monica Mountain Conservancy. Union Station is visible in the distance. 34° 3.4′ N, 118° 14.275′ W. Marker is in Los Angeles, California, in Los Angeles County. 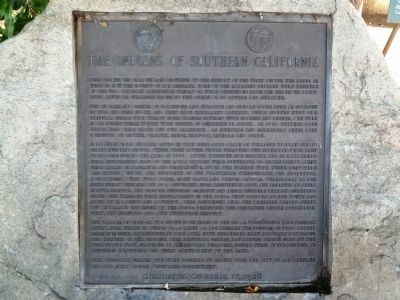 Marker is on North Los Angeles Street 0.1 miles west of North Alameda Street, on the right when traveling south. Touch for map. Marker is in this post office area: Los Angeles CA 90012, United States of America. Touch for directions. Other nearby markers. At least 8 other markers are within walking distance of this marker. Damien Marchessault (a few steps from this marker); Biscailuz Building (a few steps from this marker); Plaza Substation (within shouting distance of this marker); In Honor (within shouting distance of this marker); Headquarters of Commander Robert Field Stockton (within shouting distance of this marker); The Old Spanish Trail (within shouting distance of this marker); First Mayor of Los Angeles Under United States Rule (within shouting distance of this marker); Latino Blood, American Hearts (within shouting distance of this marker). Touch for a list and map of all markers in Los Angeles. Regarding The Indians of Southern California. There is a small collection of living food and medicinal plants, some members deceased through neglect and changing water and shade patterns over the decades. This is worthy of restoration, maintenance, and preservation. Since this marker is in deep shade beneath the trees, some pruning may be necessary. More. Search the internet for The Indians of Southern California. Credits. This page was last revised on June 16, 2016. This page originally submitted on April 16, 2012. This page has been viewed 731 times since then and 12 times this year. Photos: 1, 2, 3. submitted on April 16, 2012. • Syd Whittle was the editor who published this page.